2 months have passed by since The Lord instructed me to have a break in writing articles. I believe He saw me struggling with the words to come out of my fingers as the dryness of my flesh got the better of me. I had to be reminded several times by several anointed people that being stressed out from work, especially the work of our God is simply NOT His way (Matthew 11:30). I was physically fatigued and it was time for me to feed more once again. To dwell in His sanctuary, His Word, Who should be treated no less than The Lord Jesus Christ Himself (John 1:1). I’ve planned a lot of things for The Lord, a Christmas article on His birth, a New Year article for 2012… but all of these just stressed me out. It was all work work work… effort effort effort. And The Lord will have none of it saying: “My Son has completed everything in heaven and on earth, perfectly.” The Lord went down to my level to communicate with me, and at that time I was able to rest and feed on His word without feeling guilt from ‘not working’. 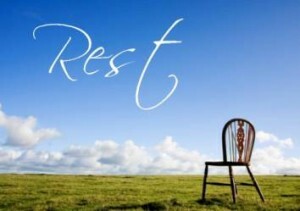 We have to be at rest in order to hear God. I cannot be both busy at work and claim that I commune with the Lord. This is why The Lord promised us His peace (Hebrews 4:1), because the only thing He wants from us is for us to spend time with Him. All these blessings around us are not only God’s manifestations of His love for us; they were also designed for another thing: to bring us into His peace so we can be with Him. Being in His peace could be very addicting, to spend time feeding on His word and to spend time chatting with The Lord, that I almost didn’t want to get out of it. This thinking and lifestyle would cause laziness and unproductivity says people. If people knew about God’s grace, His peace and His finished work, won’t people live the life of sin and slothfulness? Below is one of the stories I came across during my 2-months of ‘laziness’. If you read the story of David, one will see that his heart is wholly for God and that the only thing he wanted his whole life was to build God a house. But even this, the greatest king of Israel could not do because his life had no peace. He was fighting wars in every side of Israel that even God did not allow David to build Him a temple. It is only through the Lord’s rest that we are made effective for the Lord, which is why The Lord Jesus instructed us to labor to enter His rest (Hebrews 4:11). Wasn’t the Lord clear enough? Like what I said, The Lord will always go down our level of communication and understanding. Now that we are in peace and swimming in His grace, He can now make good use of us. May this year of 2012 be of peace, rest and unceasing fruitfulness to all of us. In the name of Jesus Christ, our Lord.